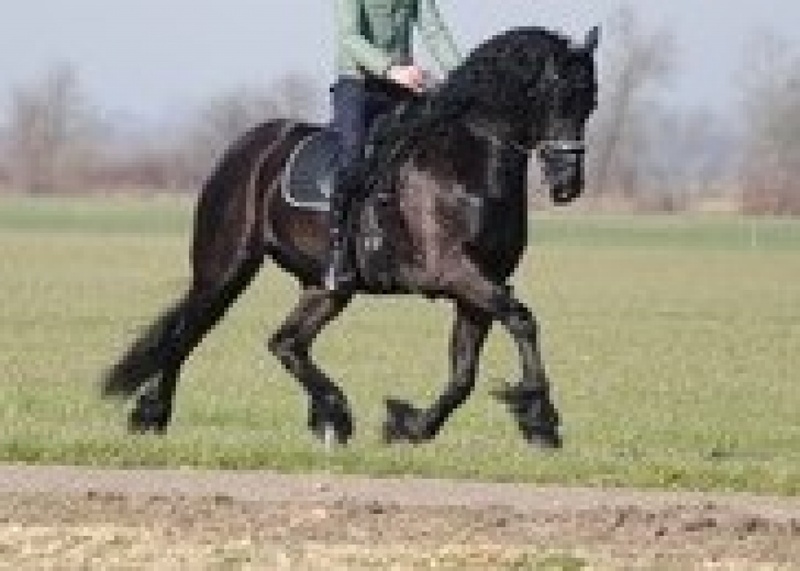 Knillis is one of the most fantastic friesian sporthorses I have ever seen! Not only does he have 2 winning points in Z2 Dressage (3rd level WITH flying changes), he is really a cuddly guy that loves to snuggle, and king of the stable! He is the kind of horse that will make you happy every day, when you are working with him---- this boy gives you the MOST AMAZING feeling when you are on him! Not only when you riding him, but everything: like clipping, grooming, trail riding, etc. etc.... he is just a JOY to work with!! He is also one of the ONLY Friesian horses who can beat the warmbloods, because of his fantastic gaits and intelligence. He is thinking with you and not for or against you. His x-rays are good and available for review with your vet. This is a RARE friesian gelding for sale that has acquired the highly coveted STER predicate, for having the BEST conformation and movement, AND the SPORT predicate, because of his high achievements in upper level dressage! Not only do riders LOVE this phenomenal moving guy, he is also friends with every horse he meets! Take a break with your dressage schoolmaster, and go on a trail or hack? ?---NO PROBLEM with Knillis, he LOVES riding on trails and in the pasture! This SWEET boy is now training for ZZ Licht, and has two winning points in Z2 Dressage, which means he has to be scoring ABOVE 62% in 3rd level competition WITH solid flying changes!! Validating the ability of the Friesian breed to compete head to head, side by side with the most notable and highly placing dressage horses in the world, this full pedigree ULDRIK son is currently one of the ONLY Friesians for sale ANYWHERE that has solid flying changes AND has acquired BOTH ster and sport predicates, and is under 8 yrs old! He is a RARE FIND ..... UNCOMPLICATED, in excellent health, always sound, and possesses exceptional honesty and character. This AMAZING Friesian gelding is just now hitting his Prime! 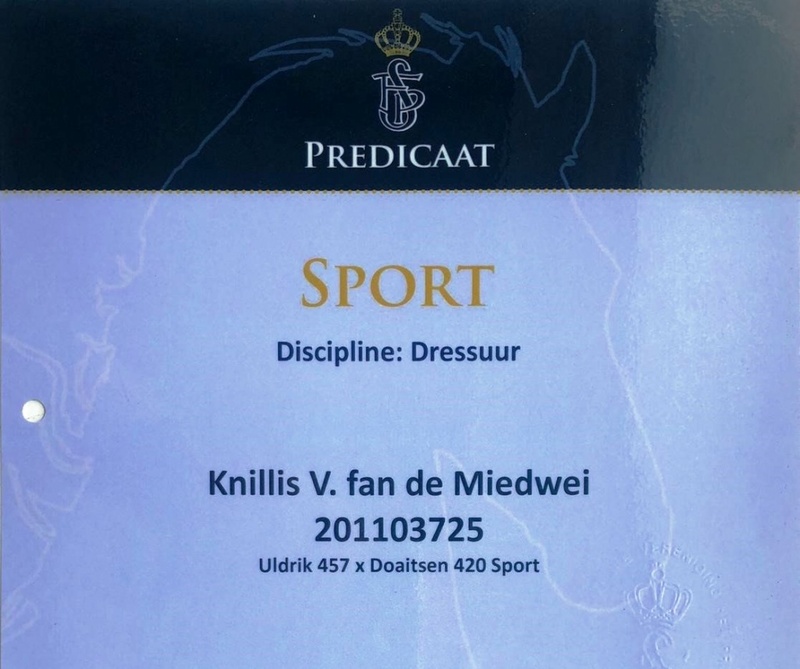 And aside from being the absolute perfect Friesian Dressage mount for sport, Knillis STER is a PERFECT gentleman, and can teach YOU dressage! As you can see, this SPORT and STER Friesian gelding is a truly exceptional, “One of a Kind” boy. At not even 8 yrs old, he has MEGA years left competing as YOUR schoolmaster--- ideal for an amateur rider, or as a youth rider’s horse, that can teach his rider FEI level dressage! An amazing athlete with incomparable gaits, jet black with tons of mane and tail, and a fabulous sweet & loving temperament. If you are interested in his purchase, please contact Janna at 415-272-2112. Knillis STER and SPORT is $39,900 INCLUDING import and quarantine to NY; or $41,900 to LAX, Miami, or Canada, as well as radiographs available for review with your vet, and thorough new pre purchase exam. This one wont last, just watch his video…..and drool…..